A patent was awarded by the US Patent Office in 2013 for the Sawmill design. With the rise of the internet and the free flow of information, it has been increasingly difficult to protect original designs. While the result of all this is cheaper pedals for the masses, it also creates a reluctance for talented designers to continue in the marketplace. Long term this hurts the whole industry. The patent approval process is a difficult process with a Patent Examiner trying to find reason to disapprove the application. Of course every challenge from the examiner has to go through a lawyer which always costs more dollars. In the end we were able to defend the challenges from the examiner and a patent was awarded. If you want to see innovative designs, please support our effort. Pedal designers, if you are interested in licensing the design or if you want to know more about the patent process for a pedal design, please contact us. 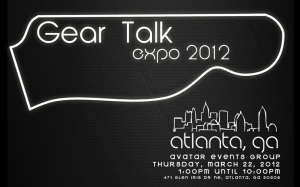 Come out to Gear Talk Expo March 22nd in Atlanta. Gizmoaudio will be sharing a demo room with Fat Pig Amplification. For more info look at Gear Talk Expo event on Facebook.